Home » Blog» What kind of services do IT staffing companies provide? If you are wondering what is a staffing company, the article will help you understand what it actually is and what different services a staffing firm can provide you. To begin with, an IT staffing company helps businesses who tend to fill the vacant positions but are facing problems in finding skilled and deserving candidates for the required position. A staffing agency that consists of a variety of talented professionals to assist the requirement of an organization makes use of several resources to get you a skilled candidate who can meet the goals of your business as desired. Now, if we talk about the services that staffing industry offers, the staffing industry includes its own acronyms which might sound confusing to people who do not use the terms frequently. The article explores some of the significant staffing services that you may not be aware of. If you are looking for a candidate to be hired for an open position, you may go for this type of staffing service with a staffing agency. Wondering what this type of service actually specifies? Well, opting for contingency search gives you an opportunity to examine the skills of the candidate provided by the staffing company for a particular period of time. Having said that, if you do not find a candidate efficient enough in the specified time period, a staffing firm will refund your fee or will provide you with the replacement of the candidate. So, you have the power to test the candidate before confirming him/her for the required position. In a situation where you need an extraordinary candidate with exceptional capability to meet the requirements of a senior level position, retained search, one of the efficient IT staffing services, will be the best choice to meet your objectives. While opting for this type of search, employers pay an upfront fee to the recruiter and retain him, thus providing him the exclusivity for the job. So, if you have used all the cheaper search options, but did not get the desired results, this lengthy, though efficient search, might help you fill the vacant position. Retained search, in comparison to other types of searches, takes longer time and performs a rigorous search to accomplish the needs of the client. An organization looking for a large amount of employees to fill several of its positions must go for contract recruiting. Under this kind of staffing service, an organization hires one of the recruiters from the staffing services company in order to accomplish the recruitment process required by them. We call that human resources professional a contract recruiter, who, as per the contract, is supposed to work at the client organization unless the required job is completed. The contract recruiter follows the direction given by the client firm. If we talk about the payment process for this type of services, an organization pays both staffing firm as well as the contract recruiter based on a discussed hourly rate. Moreover, the process does not involve the number of candidates hired for the company. The process just focuses on the number of hours the contract recruiter worked for the client company. Contract recruiting, at times, is used in place of contingency searches. Moreover, the service proves useful if an organization is short of human resources professionals. Opting for contract recruiting service will, thus, benefit a company by offering a recruiter on-board rapidly. A solution to the high volume recruiting staffing needs of an organization is onsite management. It’s an arrangement where staffing firm sends a number of recruiters to work at the client company. This type of services is usually desirable when the hiring managers of the company, in order to hire a large group of employees to fulfill some high-level positions, need to coordinate with the recruiters belonging to a concerned staffing firm. Moreover, the staffing company, in this case, may offer temporary staffing, contingency search, or any other kind of staffing service. It’s a kind of employment arrangement where a client company will take the services from the candidate as needed, but a staffing firm acts as an employer for that candidate. In other words, an organization asks the staffing firm to keep the candidate on its payroll, which not only makes a staffing company an employer of the candidate but makes the firm responsible for the candidate’s payroll administration as well. The process of payrolling, thus, reduces the risks for the organization as an employer. Moreover, you will not be accountable for any administrative costs as well. The process is generally used in the situation where the budgets of the company or a company’s policy do not let an organization go for a full-time permanent hiring. The process of payrolling will not all affect the way you run your organization. So, payrolling, at times, proves to be a useful tool which provides an organization a comfort of lower costs, less administrative fuss, and excellent HR support. Related: What Are the Benefits of Staffing Agencies? One of the staffing services which is in high demand by most of the organizations is temporary staffing. It’s a kind of service where IT staffing firms are responsible for recruiting, screening, and hiring the employees, thus giving rise to a large amount of highly skilled candidates. Organizations, usually, go for temporary help as they prefer to hire temporary staff to complete their projects. The process allows an organization to attain flexibility and an easy access to talent. 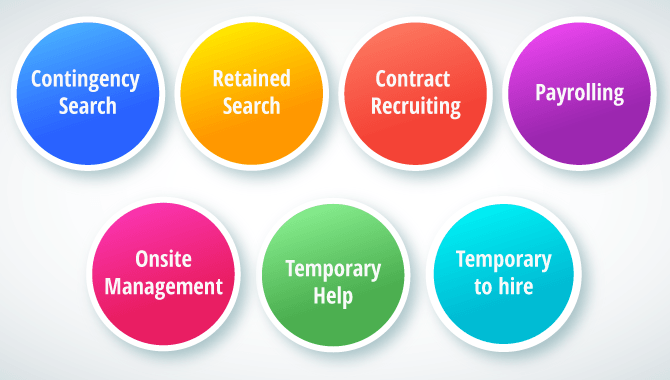 Also known as temp-to-perm, this kind of staffing service is almost similar to the temporary-to-hire staffing service. The only difference is that a client, in this case, keeps a candidate with the intention of assessing his skills so as to consider him as a permanent staff member of their organization. So, a client company has an advantage in this case as the client gets an opportunity to examine the ability of the candidate in accomplishing certain tasks. Mamsys, one of the renowned IT staffing companies, offers different kinds of staffing services exactly in line with the requirements of a client company. So, all you need to do is select a staffing company that has an expertise in finding out the right candidate for the right job. ← What Are the Benefits of IT Staffing Agencies?